Nik Wallenda walks over Niagara Falls! Just a few blocks from our offices at Telephone Magic and Hotel Telecom, Nik Wallenda made history tonight, walking across a high wire over Niagara falls! Wire walking over Niagara Falls was outlawed in 1890, and many thought this day would never come, but a couple of months ago Nik Wallenda received permission to attempt the feat. This was the first time in history that a wire walk was actually performed over the Falls. Previous attempts were made farther down the lower Niagara River or lower in the Niagara gorge. 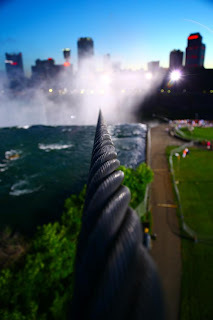 Wallenda had his wire about 20 stories above the Niagara River and walked right over the American Falls and all the way to the Niagara Parkway on the Canadian side. Nik Wallenda is from the famous first family of funambulists. The signature performance of the group in the 1940’s was the seven-person chair pyramid in which two pairs of performers walk the wire, each supporting another aerielist on a pole. Those two aerialists, in turn, carry a pole upon which the seventh member of the troupe balances in a chair. Wire walking danger is not unfamiliar to Nik Wallenda. The family patriarch and Nik’s great-grandfather Karl Wallenda fell to his death in 1978 while attempting to walk between two hotel in San Juan, Puerto Rico. Tonight the biggest challenge was the thick mist rising up from the water below Niagara Falls and pushed by a swirling wind, drenching the wire and causing visibility problems for Nik Wallenda. The water literally POURED off the wire as Nik carefully put one foot in front of another in what was termed “The Wet Zone”. Congrats to Nik Wallenda on his historic walk across Niagara Falls… in a world where we have become jaded to the spectacular, this was truly an amazing thing to watch… All of us at Telephone Magic feel truly lucky to have our offices located just a short walk from this tremendous event. This entry was posted in #walkthewire, Avaya, business phone system, Hotel Telecom, NEC, Niagara Falls, Nik Wallenda, Nortel Norstar, Telephone Magic, walk over Niagara Falls. on June 16, 2012 by jjackson.